Above are generations 1-3 of the HS2000 pistols, with the last being an SA-357 that was essentially the precursor of the XD Pistol. The generation 0 pistols were never imported into the U.S. and is not pictured. This is essentially the 15th anniversary of the basic XD design. Originally known as the HS2000 pistols were first imported into the U.S. starting late 1999 and early 2000. By the end of 2001 Springfield Armory had become the sole importer of the platform that had then been renamed the XD pistol. During this short time early in the platforms life many changes had occurred fine-tuning the ascetics of the pistol. By the time Springfield Armory took over the pistol, its design been though 4 generations giving us the XD pistol that we know now. The XD MOD.2 comes in a newly designed case, thats not quite as robust as the Pelican style versions from the last couple of years. 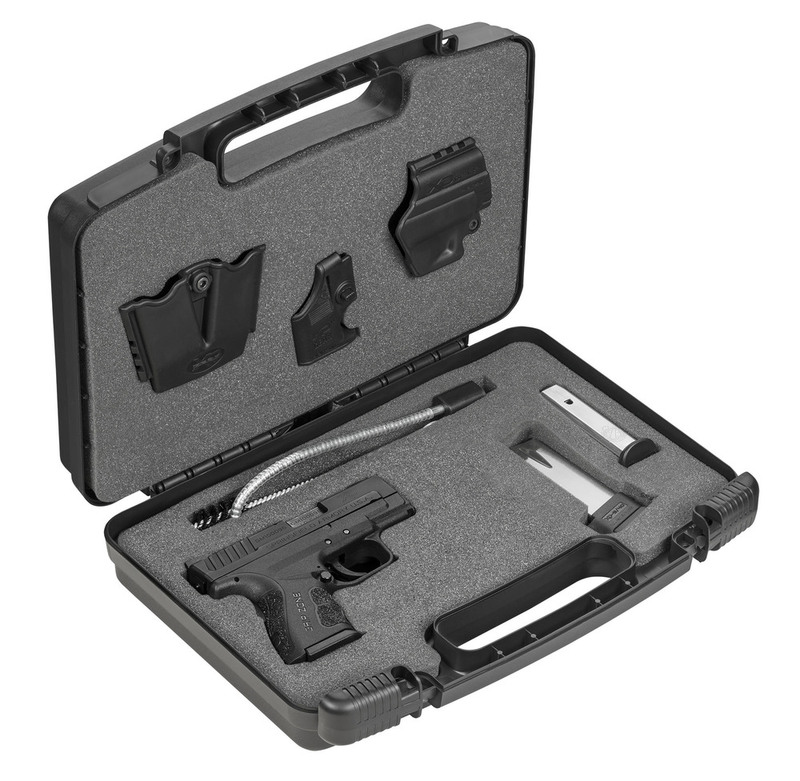 The good news is that Springfield has decided to continue to give customers the "Extras" kit that includes a holster, magazine pouch and magazine loader. These photos are springfield promotional photos and I do not think that the MOD.2 comes with three magazines. The kit I received came with one flush mount 13 round magazine and one 16 round extended magazine. The MOD.2 uses the same magazines as the Classic XD pistols that are readily available. The XD MOD.2 is a model 2 version of the classic XD subcompact pistol. Internally both pistols share 98% of the same parts and are interchangeable. Externally the list of Improvements start with the sights. The XD MOD.2 comes with the same fiber optic front sight as the XDS. Inside of the pistols box is a baggie with extra green & red fiber optic rods. The rear sight is the same one that comes with the XDM pistol. Since this first MOD.2 is a subcompact pistol, utilizing the longer XDM rear sight buys you almost a 1/4 inch of sight radius. Both faces of the sights feature serrations that should help cut down with glare. Even though the MOD.2 is different it still can use current XD grip accessories. The MOD.2 kit comes with two magazines a Flush mount and extended magazine. The extended magazine gives you 16 rounds in the 9mm version and 12 rounds in the 40S&W version. My hands are just big enough that my pinky finger will fall off the bottom of the flush fit magazine or awkwardly rest right on the lip. It is because of this it is my personal preference is to use some type of extension it just makes the pistol more comfortable to shoot. As you can see the Pearce Grip model PG-XD standard grip extension for the classic XD fits just fine with the new MOD.2. The MOD.2 features more aggressive take down and slide stop levers for increased ease of use. The new 3D levers actually give you increased leverage and purchase making reloads and field striping a simple task. Taking a look at the trigger guard we see two popular aftermarket modifications that are now standard. The area behind the trigger on the top finger groove of the trigger guard has been raised allowing for a slightly higher and more comfortable grip. The front of the trigger guard has been rounded off, they say it helps with snagging. Trigger guard hooks were all the rage in the 80's and since had become standard equipment on "combat" type pistols. The theory was that you could hook your support hand first finger on the hook to help hold the nose of the pistol down while shooting. What was in vogue back them is now just an unneeded carry over that can get in the way of things. 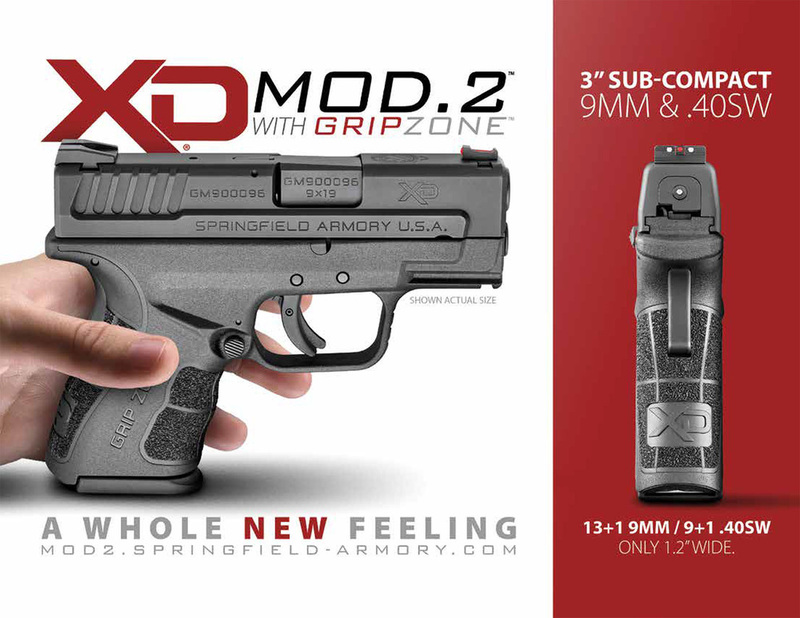 Springfield Armory Calls the grip "The Grip Zone". What this entails are three different texture zones with different levels of aggressiveness. Springfield tells me that they went though a lot of effort to make sure that they maximized the effectiveness of the grip for optimal performance. On the front strap you will notice the new addition of finger groves. These are useful but do not get in the way or make for an uncomfortable grip. There are other brands of pistols that one repeated complaint is that the finger groves can interfere with a proper grip. Springfield unlike other brands did not add to the circumference of the grip to add finger groves. Notice my picture of the MOD.2 with the blue line. That blue line represents were the front strap was with the classic XD's. What they did was cut into the frame slightly reducing the grip radius. Just that little bit makes a world of difference and just feels good in the hand. Add in the new texturing and it is easy to have a solid grip even with small hands and become one with the pistol. To quote my my wife "it felt like a good comfortable grip without having to stretch my hand". "It had a nice texture that provided grip without being rough or sharp"
Looking at either side of the frame you will notice a more pronounced and angled finger grove. Were before the classic XD's had a simple oval indentation on the side of the frame which was nice when your trigger finger pointed strait forward but did not help when you actually needed to reach the trigger. The new MOD.2 finger indentation is deeper and allows for your finger to point forward when off the trigger, but is also angled on the bottom. The bottom angle allows you to actually reach the trigger again by reducing the grip radius in the area you need it. When you look at it it just makes sense put the indentation were your finger is when you actually need to pull the trigger...duh. The back strap features the new more aggressive texturing zones for better purchase. The new MOD.2 also features a "high-hand beavertail" that is slightly higher and re-contoured allowing you to get the web of your hand even higher into the back of the pistol than before. Moving onto the back of the slide you will notice why the back of the XD now looks like an XDM. They playfully incorporated both slide shapes in such a way to add a rear scallop. This new scallop acts just like a slide racker would on a competition pistol. It is just enough "meat" for your finger to get ahold of and rack the slide with more authority if needed. It does not matter if your hands are sweaty or dry it is now easier to manipulate slide. The after market Pearce grip fits remarkably well and nicely matches the zone 3 light texting of the frame. The grip also fits the contours of the grip nicely and looks like it could be an OEM item. In my opinion this is a must for subcompact type pistols. The Factory extension is a disappointment though. While it is functional it is now ascetically unpleasing. Springfield spent such effort into making up the different texture zones that it seems like they dropped the ball when it came to the magazine extension. They used the same extension that is used for the classic XD's. The older grip extension does not match the textures or look of the new pistol. If you look closely the the pictures you will also notice that along the front strap with the extension it does not fully follow the same contours. This slight off set can be annoying. I like combining old with new just not in this case. Change is tough especially after 15 years, what you have grown to love suddenly becomes different. But change is not necessarily bad, especially when they make a gun that I already loved even better. You take a look at each new feature and realize that someone sat down and stole my thoughts on what it would take to make a good gun even better. While some my criticize that these are only cosmetic upgrades, which they are. You really need to feel it, hold it and caress it to find out that Springfield and HS Produkt really have something special here.